Antiques challenge. 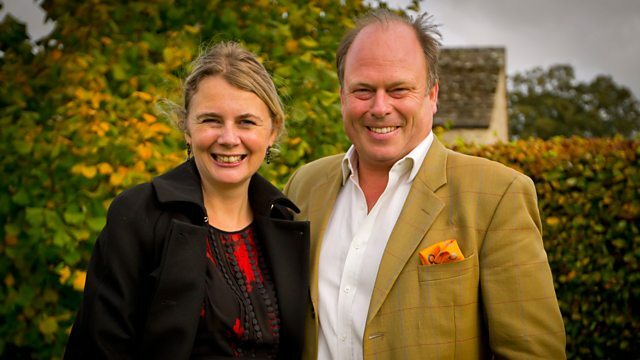 Experts James Braxton and Catherine Southon compete at a car boot sale. Catherine spots some silver and James thinks he's onto a winner with a car door. Browse content similar to James Braxton v Catherine Southon - Car Boot. Check below for episodes and series from the same categories and more! -You have yourself a deal, sir. I've got a deal. You've got a steal. Cycling through your French countryside. Bunch of onions in? -Baguettes hanging out the back. -Oh, yes, I like that idea. ..and James throws his profits up in the air. What I was going to do is I was going to set you a challenge. I'm going to give you three pieces of paper. Every piece of paper you get in the basket is a fiver off, chief, OK? Welcome one and all to today's boot sale bounty hunt. buccaneers go head-to-head in the search for treasure. Our first profit-hunting pirate is a fearless auctioneer. He's on home turf here in Sussex and he's hungry for victory. I'm keeping an eye out for bargains. who lets nothing stand in her way. It's Kent's own ace auctioneer, 'Canny' Catherine Southon. Let's hope this is all plain sailing for now. Oo-arr! as we're at Brighton Marina car-boot sale. there's plenty to whet our warriors' appetites. they make will go to their chosen charities. -It's very early, isn't it? Far too early. I know. I'm normally coming in at this time when I'm in Brighton. -Have you been to this booty before? -Marina. No, I haven't been here. -So you're going to stretch the 250? -It's going to go a long way. I'm not intending to spend anywhere near 250. I think it's going to be fun. It's looking really busy out there. -I know. Well, you go that way, I'll go this. Bye. but, never fear, as our very own bird of prey has a clever strategy. because I'm looking perhaps for something sparkly. Maybe a piece of jewellery? Anyhow, I'm on the hunt now so wish me luck! So 'Canny' Catherine is looking for a diamond in the rough. and you're told it's a fiver, so I should be buying quite cheaply. I've only got £250. I should do well here. Really looking forward to it. but he's keeping a tight grip on the purse strings today. Perhaps a small item to start then? I'm fascinated in your 2CV door. but Bingo's spotted another couple of lots on the same stall. What about your Pablo Picasso? Pablo Picasso, well, it's only an exhibition print. 25. I rather like that. I like that. And your bricklayer's trowel? but seemingly a good name. Yes, a trowel, a painting and a car door. is there a bit of a deal to be done on the door? -Could you do 65 on it? -How about the whole lot for 100? 70, 25 and I think you've got yourself a deal. our very own master of the trade has snapped up three items. Now, the idea, what is the connection? I have a trowel, I have a 2CV door and I have a print by Pablo Picasso. Rather interesting. This cheapest item, £5, I like this. This is a very nice bricklayer's trowel. the 2CV door and I paid £70 in all for that. Where's it going to go? Restaurant? 2CV restorer? I like this. This has integrity. It's not just a print. It's a print for an exhibition. Where does my profit lie? I think this would be fun on a wall somewhere. Somebody will have a go at this at £70. I'm seeing this at 100-150.
and it seems old 'Canny' Southon has become a Francophile too. This little yellow post bag, La Poste, so French. Yeah, they were French. Put on your cycle. -Maybe to put your bunch of onions in. Oh, yes, I like that idea. You could even wear a little French hat at the same time. ..cycling through your French countryside. -So where exactly would this go? More on the side of the bike? to either side of your cycle rack to give you the extra carrying room. Can I give you £6 for the two? We'll go for eight and I'll shake your hand on it. All right, I will shake your hand. So, that's her first purchase in the bag. Get it? In the bag(!) Yes. My first colourful purchase and £8. but I think these have perfect potential. and quickly nets item number two - a copper jam pot for £12. I'm rather chuffed with this for £12. Well, I think I can make quite a bit of money out of this. but Bingo is hot on her heels. I think I am feeling confident. Is it my natural environment? Probably not, but I'm a good adaptor. We never doubted you, Bingo. but James won't let anything stand in the way of his quest for profit. -I think it's for thistles, isn't it? Yeah, for taking thistles out of the... So you've got a good purchase. -They normally make about a fiver, I'm told. -Do they? Call it six quid? -I'll take it. Thank you very much indeed. No more thistles on my ground. our auctioneer action man bags his fourth item for just a few pounds. but she's taking her time and surveying her hunting ground. It's interesting here. You do get the real car booty people. but you also get a couple of antique dealers, so there is a real mix. on a shiny skating coin. Quite interesting, isn't it? Would be nice if it was silver. -Just quite quirky. How much is on that? -I've got 12 on it. I'll do it for six. and then I might have struck gold. -What about these? These are nice. Lantern slides. I'm really passionate about things like this. they didn't have TVs, didn't have radios. They had things like this to entertain the family, didn't they? would sit there amused by these strange little scenes going on. Lynn, how much would you like for these? They're £18 each and I really would like 15. I'll give you 60 for everything. -I can't do it really. Can not do it on those. slip through her fingers and she quickly seals the deal at £70. but the medal is right on Catherine's sparkling strategy. and I would say possibly a sort of medal once upon a time. but I think the detail on this is absolutely super. It's a really classy thing. Whatever this turns out to be, I think I've definitely struck gold. I went and bought seven comical Victorian magic lantern slides. and the colour is superb. It's as clear and as crisp as the day they were painted. They probably date from about 1870-1880. This is definitely going to be another winner. with another two items in her stash. Time for Bingo to bring out the big guns! -How much for Tony the elephant, the stool? -It could be a seat. It could be a pot holder. -Could be a pot holder. It could be yours and you look very comfortable on that, I have to say. -I feel comfortable. Thank you. I do. -Yes, you DO look comfortable. -Will you take a fiver off? 25? -OK. I've got a deal, you've got a steal! And a bit of poetry chucked in for free! I like this. Why do I like it? I love the elephant mask. There's something very attractive about elephants. It's not the smartest garden seat you'll ever find. It's a bit wibbly-wobbly, but it's all about character, isn't it? I think it's made in China. It's made quite recently. But you're getting quite a lot for your money. You're getting a seat, ceramics and three elephants for £25. What am I going to do with this? Tony the elephant. I'm hoping to sell it. This is not the finest fellow. Where does the great meeting of taste happen? In your local Indian takeaway. Ah, clever. Lining up the buyers before he's even left the boot sale. A master at work. Now, Catherine had better keep an eye on him. Let's try and find that Bingo. to find the gold and who's looking likely to walk the plank? Our experts each arrived with £250 of their own money. James 'Bingo' Braxton has been flash with the cash. leaving her £160 still to spend. Our duo are taking this seaside car boot by storm. -You're out-smiling me. What's going on? I've woken up, I'm alive. There's some brilliant things to buy. I've spent money. Notes have been exchanged here. Not single coins. -I've rather plodded, I think. -I've bought some interesting things that I'm slightly bemused by. Your confidence, your smiles, it's wobbled me. -Don't worry, James. Don't worry. -It's all a face, honestly. -Be gone! Take your cheerfulness away! Mm, looks like 'Canny' Catherine has got old Bingo rattled. I didn't like way Catherine was so smiley and cheerful. at this car boot, whereas I found it more difficult. I think I've got to smile more, be cheerful and just get on with it. seems to have been a bit of a front. sort of the tail end left, so I need to get working very quickly. Let's hope James is in same situation. until you put them into hot water. Or maybe that's just tea bags. I'm liking these, these are good. gymnasium...type pommel horse type of things. -So you put them on... You fix them on a beam? I like them. They've got a good look about them. I'm not sure what I'd do with them, but they are good. -How much do you want for them? but I can't pay that much. Catherine, I love you to bits, but I can't do it. The auctioneer extraordinaire does it again! Bingo has set his sights on a little French jug. -I like that. Isn't it a great shape? It's a funny glaze, isn't it? but it's just a lovely shape, isn't it? Looks as though it's on the move. And good design should almost always have humour. It's a lovely little pitcher. -Ricard, which is the aniseed-y aperitif, isn't it? How much have you got on it? What would be your offer for it? I was going to say 10, but I don't want to insult you. -Pour vous quinze euros. Quinze livres. -Quinze livres is 15, is it? -Yes, of course, it is. In case anything was lost in translation, Bingo paid £15. But is Monsieur Braxton having doubts already? I like the shape of it. It has a sort of beaky, animal-like look. as the boot sale's drawing to a close. So our brave knight goes straight into battle over a bamboo basket. How much for this lovely fellow? You have a deal, man. Rather nice, what, wastepaper basket - whatever you call it. Made of bamboo, very resourcefully. I like it. And I'm sure somebody else will. And at £10, I see good profits in this. And with that, Sir Bingo's day is done. He's got seven items under his belt and he's feeling confident. the sun's out, the smile became broader. I found unusual items at cheap prices but great quality. I wonder if Catherine was able to match it? Catherine's feeling the pressure to root out some last hidden gems. I don't like that bit! while her opponent is kicking back and relaxing. and she's quick to add them to her haul. but I didn't quite think I would be buying a pair of whelk pots. Nevertheless, these are pretty damn special. maybe to a fish and chip shop. But I don't think I will paint them black. I think they look wonderful as they are. £10 a pair?! You can't say fairer than that. brings our buying bonanza to an end. As they get ready to show off their wares, let's tot up the totals. James and Catherine each arrived at Brighton with a budget of £250. spending just £1 less than Bingo, at £155. have a chance to check out each other's spoils. I've had so much fun, James. I don't know about you. The best car boot ever, one would say. But your items, I have to say, look fantastic! See, I can see that on the wall of a French cafe or something. That is rather classy, I think. That, on the other hand, I would put that in the not-at-all-classy camp. -Why did you buy that, James? that will see great beauty in this. Is this a hoe of some description? No, they've got holes... That's bigger, a hoe. Good husbandry is all about keeping thistles and ragwort away. You just get them on the roots. Your magic lantern slides are beauties! Thank you! What really stood out, was the colour. I think the colour on these is super. Pommel horses, down there - 55. You'll have to do something cunning with those? -Well, they don't call me cunning for nothing, James. So, our car boot bounty hunters head home to plan their selling strategies. This is where the Put Your Money challenge is won or lost. and eke out every possible penny of profit. and prepare to haggle their way to victory. In East Sussex, the sun is shining on Braxton Towers. Ah, there we are, the dear old car boot. and my most expensive item was that door. But I just don't know who to sell it to. where they just sort of mount it - hang it on the wall. And my lovely elephant stool. I'm hoping to sell this to my local Indian restaurant. So, from the stool, go to the jug - a nice little Ricard jug. Paid quite a lot of money for that. It's a nice shape though. Then we go on to the bricklayer's trowel - rather nice. I need to find a bricklayer for that. And then this fellow. I said it was a thistle dodger. I've been corrected. It's a thistle spud. Bought that for no money. or they want a litter bin somewhere in their home. But I like that. I like that Picasso poster. who doesn't quite have the 40 million for the original. How did I do at the car boot? I think I bought a very eclectic mix of items! eclectic is one word for it! Over in Kent, canny Catherine's feeling buoyant. Probably the most weirdest of them all are these pommel horse things. and make them into little cute seats? is this little medal down here. or perhaps people who are interested in sporting memorabilia. I think I've given myself a bit of a problem there. or maybe outside a fish and ship shop? Are you with me? he is going to love these. The postbags - they're a bit of fun. And I need to find somebody who's interested in cycling. This is my final item. It's a Victorian copper jam pot. because really that's where it belongs. but I think a pretty damn good selection. and a war of the wacky! and find buyers for their booty. and, remember, until they've shaken on it, the deal's not done! which cost him £25. Poppadom anyone? and I can say I'm no stranger here. Or maybe Bingo's a vindaloo kind of guy! Anyway, what will owner Ahmed think of the seat? I like the elephant mask. I always think stools are rather good. Yes, and it's a nice one. Very nice. -The colour is very nice. White. I thought I might get somewhere around £100 for this. Yes, that's OK. £100 is fine. -Yes, I can take it - £100. That would be very kind. It's yours now! and that's a £75 profit. for double what he paid for it. Go on put it there, chief. Well done. Making James another fiver in profit. Canny Catherine needs to get out of the gates. but just where is she? Je suis ici, en Angleterre. to see Graham who has a vintage bike shop. Now vintage is very on-trend at the moment. Let's just hope he goes for these babies. but will owner Graham think they're fantastique? But I brought you something which I think is a bit more exciting. -What do you think about these? -They are certainly very bright. They would brighten up the shop, wouldn't they? And that's because they are the postal colours of France - La Poste. -but are they saddle bags or panniers? they are meant to be fixed to a pannier like this. And would remain in place during the day. They wouldn't be taken off. -So, tell me, are you interested in them? I doubt I'd buy them for more than £20. -See what they look like. -What, me on the bike? -You on the bike riding around. -Is that a deal for £20? and now she has to take them for a spin. So are you happy, Graham? You've done a good job. Good modelling. -They look good, don't they? -Yeah, they're fantastic, thank you. The things these experts will do for a profit! Bingo is also on a quest to sell his French fancies. I'm here in Battersea, London, to see an old friend called Jules. I'm hoping to sell him my 2CV door. if he's game, this mystery buy. Ah, a hidden mystery buy. Just keep 'em guessing, eh? but will art collector Jules be up for buying? -Bonjour, mon ami. Mon ami, mon copain. -It is, actually, I will say it's a beautiful colour. -And I do like the green, funnily enough. with some genuine French rust on that. It is a bit of European post-war history. Exactly what one could do with a door, I don't know. -But you've got an idea. -I've got two ideas, actually. with this and say, "I'm getting you a car, lad. "And by the time you're 17, you might have a complete car." of a friend of a friend that knows them quite well. and get it worked on by one of these local artists. -That would be fabulous. Another installation. Now, are you going to love it, Julesy, when I say 150 quid to you? I was going to go more 50 actually. -It's a bit low, actually, isn't it? and I've got a little mystery buy for you. 135 and you can have the mystery buy as well. OK, well, you say... How about 120? Includes the mystery buy. -I'll tell you, 125 and you can have both. -125 for both? OK, 125. Bravo, Bingo. Time for the big reveal. And here is your mystery item. Oh! Really nice, actually, yeah. Ricard Anisette. What a lovely view - French jugs and a French door. and that makes James a profit of £40 on the pair. Je t'aime le challenge. That was a challenge. Two French items to the Englishman. Catherine, comment ca va? She's doing very nicely, thank you, Bingo. She's galloping on to her second potential profit. and I've come to see Laura who's an interior designer. and more importantly, a profit for me. at £55 for the pair, so she's hoping for a gold medal worthy profit. -You know when you have the pommel horse? -I think they're for training. -What sort of age do you think they are? -'60s or '70s, I'd like to say. Straight out of a gymnasium. I mean, what would you do with something like this? I've got a couple of ideas. and create a table or I think they'd make great little footstools. I just think that something like this could possibly work for you? I think so. It depends on the price. For me, somewhere between 100 to 120 ish would be nice. I was thinking more around the 70 mark. I prefer somewhere around 85. -Could we settle on 80? We could settle on 80. Yeah. I am sure that these will be amazing. Well, it's a modest £25 profit for Catherine's coffers. let's take a peek at the books. James has done an impressive four deals and made a profit of £120. so far, and her profit pot stands at a very modest £37. but with four items still to sell, the game is far from over. and she's fired up for the challenge. Let's turn up the heat and get cooking. so let's just keep our fingers crossed. Now, our ace auctioneer pays just £12 for the copper pot. Time to unveil it to jam-maker Michelle. -Right, I know you make chutneys and jams. and I just thought it was a really nice jam pot. It's got VR on, which tells us it's Victorian. but then that might just be how it's been over the years. Do you use copper pots when you make your jam? I don't, because I haven't been able to actually ever find one. -So actually, you've done me a real service here, as they say. Good. Oh, well, the price is going up and up and up. -So it all comes down to money, then? -What does that sound like? -I was thinking more 45-50. -£42.50 sounds good to me. Let's go £42.50. and a very tasty £30.50 profit for our jammy dealer. Well, Bingo, I am seriously cooking on gas. Yes, we love a kitchen pun. she sells them to the first fish restaurant she goes to. -Is that your best offer? They're blooming heavy, so I'm going to let you have them for 25.
and nets our daring dealer another £15 profit. She's having a Brighton bonanza. Meanwhile, Bingo's been a busy bee too. selling it to a farm in East Sussex for a tidy £14 profit. which, in such a closely contested game, could make all the difference. to take his final item to see an old school pal. and that's when you wrote with a pen and paper. Well. Let's see what he makes of the bamboo basket. It cost Bingo just a tenner. we still have that formality, don't we? -You refer to me as Mr B. You are Mr C to me. -I would always do so, yes. Anyway, Mr C, I have brought you this wastepaper basket. Why have I brought you this wastepaper basket? Former speech-writer, before the computer. Yes. No, one used to get through a lot of paper. so if you're chucking something in anger, it'll spin in. Do you think it might favour the hooper? Er, very much so. It could favour anything. Or, again, against a wall, you could get a sort of back drop in. -I put to you, it's a very handsome fellow. It's a nice big size. -No, no, it's a decent size. -I was going to charge you 40 quid. You can scrunch it up in a ball. Every piece of paper you get in the basket, it's a fiver off, chief. OK? -So I'm going to put it there. Hold on. Steady on, steady on. -You're going to come back a bit. Every hoop in is a fiver. You're happy with that? Oh, I'm down a fiver. -Got lovely action, if I might say so. -Fire up your abacus, Mr B.
Ah, £15 down, but Bingo is still happy with it. So three clear hoops, that's £25 to you. -I think I'll go with that. Hmm, sealed with saliva? An old school tradition perhaps. but Bingo's still more than doubles his money, banking £15 profit. but his opponent still has two items left to shift. and she's got a particular buyer in mind. I'm in Newmarket and I've come to see Richard. He's a member of the Magic Lantern Society. and he said any time I get some more, to give him a call. Turn the lights off, get the popcorn out and watch this show. Oh, lovely. As long as it's not a horror flick. Remember, the slides cost her £64. -Hi, Richard, lovely to see you again. -Really nice to see you. Because they've got the glass in the back to move it from side to side. -I thought they're actually really bright. -They've been kept very, very well. Yes, they're in nice condition. -Let's have a look at the...wicked monkey or cheeky monkey? -And now he's just beating it. -Treating it like a racehorse. -Oh, that one made me laugh. Cos you've got Punch. -Going in the punch. I think that's brilliant. -We often call these, "What happens next?" slides. -And then you get all the children shouting out, "I know! I know!" She's going to run away. No, she's not. She's dancing. Not the best effect you've ever seen! -She's not the best dancer, is she? So before us, it all comes down to money. And if you're interested in buying them. I thought they would be worth about £25 each. I could go to £15 each. -That would be 105, would it? That's pushing it then. That's it. -Well, that's good enough for me. Well, that showing was a great success. Richard's happy and I'm happy and there's more money in my pocket. Yes, a thigh-slappingly good sale. she hot-footed it to Hungerford to find a buyer for that skating coin. It turns out to be solid silver and antiques dealer Pete is interested. and both our enterprising experts are sold up. and who will be a mere threepenny bit? First, let's remind ourselves of what they spent. Both our experts took £250 of their own money to the car-boot sale. James bought seven items and spent £156. Catherine only made six purchases, but spent nearly the same at £155. But now it all comes down to profit and who sold well. -Good to see you, James. -Good to see you, Catherine. -What a lovely day that was, wasn't it? -that was one of the best car boots I've ever done. -and we bought some really interesting things, didn't we? Loved the car door. What happened to that? The car door, I sold it to an Englishman. What about your funny pots? -They weren't funny, James. They were whelk pots. I went back to Brighton to sell them, which was quite funny. And I had a nice... Do you remember the lantern slides? -Did they do all right? Let's have a look. One, two, three. -Oh, that is so close. -Enough for me to buy you a cup of tea. -That's very decent of you. Oh, only £1.50 in it. To lose the car boot by only £1.50 is... Well, it's too close. And the reason I lost that was that Pablo Picasso print. I should have walked on by. All that getting up early, well, it was worth it in the end. A tiny pinch of a margin, but it was a win. go head-to-head at an auction in Somerset. I'd be lucky to make a good profit on that. James Braxton and Catherine Southon battle over bric-a-brac at a car boot sale in Brighton. Catherine spots some silver and James thinks he's onto a winner with a car door.